Patatas bravas or papas bravas is a traditional dish of Madrid. 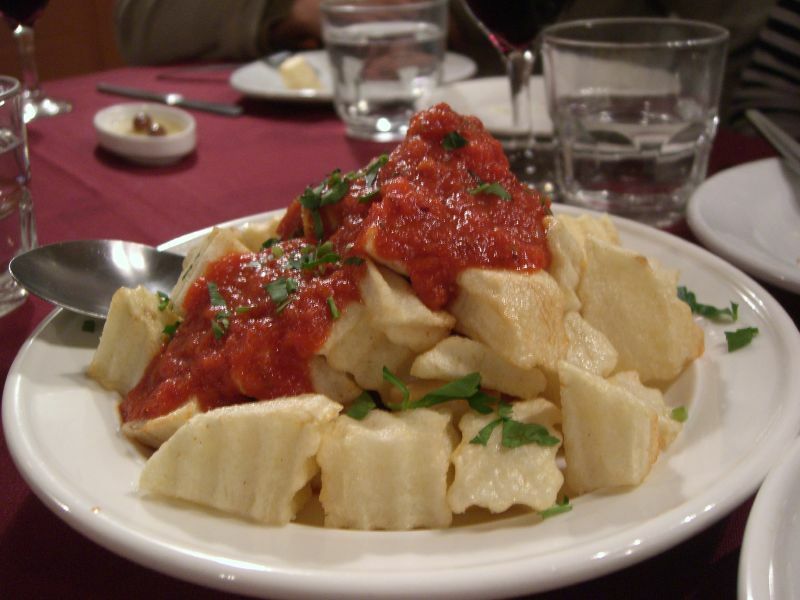 It consists of white potatoes that have been cut into 2 centimeter irregular shapes and then fried in oil and served warm with a spicy tomato sauce. This dish is commonly served in restaurants and bars throughout Spain, where it is traditionally accompanied by a shot of orujo or a glass of wine. Left: A plate of patatas bravas. The potatoes are boiled in brine for several minutes to tenderize them. They are then rubbed dry and fried in oil in a manner similar to the preparation of potato chips. Preparation of the accompanying sauce varies by city. In Burgos, the sauce is tomato-based, and also includes vinegar, red pepper, and a variety of spices which give it bite. This sauce also accompanies patatas alioli, a form of fried potato prepared with mayonnaise and garlic. In Valencia and Catalonia, the potatoes are covered in a sauce made of olive oil, red pepper, paprika, and vinegar. In these areas, the dish is traditionally served with a side of alioli. Patatas bravas are served in bars in servings that contain approximately a quarter kilo of potato. It is frequently consumed as part of tapas. The dish can frequently be ordered with a number of extra toppings, the most popular of which include chorizo, chistorra, baked chicken, and fried fish. Another popular variation is the tortilla brava: a Spanish omelet topped with the spicy sauce.